I’ve been wondering about this quaint sign hanging from the Carroll Street Bridge since I first noticed it late last year on one of my daily walks over the Gowanus Canal. I cross this bridge four times a day – to and from my children’s school – and cars zoom by, and cyclists go any direction they want. Most, I am guessing have never even noticed the sign, which hangs high above this New York City landmark, and most certainly wouldn’t slowdown to avoid a paltry $5 fine! It turns out it’s a neat reproduction by the DOT of an original sign that hung over the Carroll Street Bridge back when horses and carriages not lead-footed car drivers plodded from Bond to Nevins Street. Five dollars was, no doubt, a lot of money then. For fact freaks, the Carroll Street Bridge was opened to traffic in 1889 by the Brooklyn Department of City Works (when Brooklyn was a city). It’s one of the oldest bridges in New York City and one of only two retractile, or sliding, bridges left in New York, and the oldest of four left in the US. 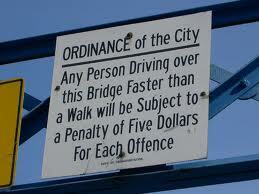 There is a retractile bridge at Borden Avenue in Queens and two others in Boston. Now, even Howard would not know that! Very interesting. How long did it take you to notice it?